Models are hinting at another strong low pressure ejecting from Texas, and moving through the Ohio Valley on Friday. That would again correlate with severe weather across the southeast. More precipitation appears to be accompanying this system, so the flash flooding threat will likely be higher. Below you can see the most recent GFS precipitation totals through Saturday. Some locations could see a quick 3” of rainfall Friday during the day. That would raise rivers and streams around the area considerably. The European model is not as bullish on the amount of precipitation, because it takes a more northern track track with the low pressure. This would still bring a chance for severe weather, but the threat would be lower in my opinion. Below is the most recent European model precipitation forecast. So why are these solutions so different? Well below you can see the surface low pressure from both the GFS and the Euro. The Euro takes a much more northern track compared to the GFS. 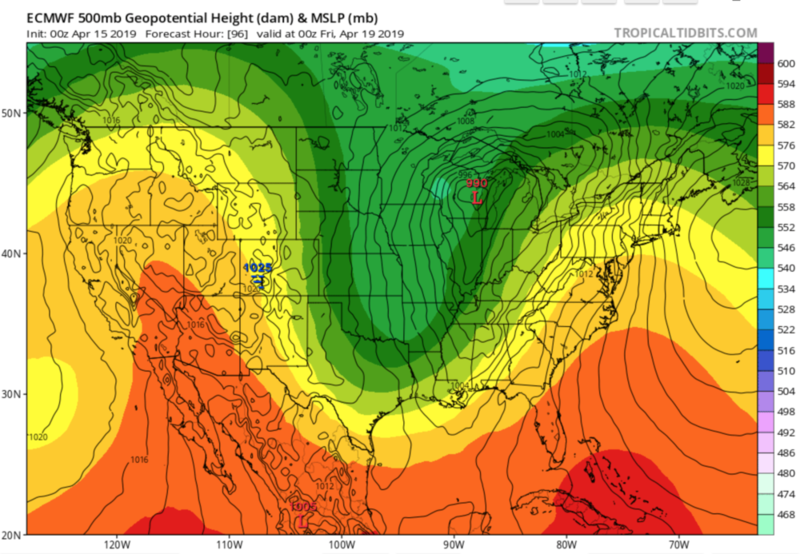 The GFS brings the low pressure close to the Tennessee Valley, and a strong warm air conveyor belt develops over WNC. A weaker area of lift is present on the Euro because the low pressure travels closer to the great lakes. Notice how on the GFS, there is some strong interaction with the 500mb low and some hail/snow breaks out over N MS/N AL. This is very interesting to me, and is something to be monitored as we progress this week. But until late Thursday & into Friday, enjoy the sunshine and nice weather because it will be beautiful around WNC!